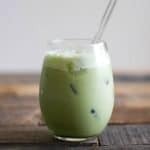 I started drinking these matcha lattes during round 2 of the autoimmune protocol. I put out a call, a plea actually, on instagram for any and all options to replace my daily coffee. When it comes to coffee, I’m a big fan of the flavor, so I wasn’t interested in a substitute that resembled it. I’m extremely particular about the freshness, roast, grind, brew, and temp, not to mention the sourcing of my coffee beans, so mediocre “coffee-ish” drink just won’t do. I tried multiple grocery store options and recipes online for coffee substitutes, but they all just tasted like, well… a bad cup of coffee. So instead of trying to replace it with something that tasted similar, I sought out to find a new flavor that still incorporated the frothy and slightly bitter taste I love first thing in the morning. Lucky for me, Laura from Sweet Treats Baking came to the rescue with her suggestion of a matcha latte. I have to admit, at first taste I wasn’t convinced. Matcha definitely has a more “earthy” flavor compared to coffee, but not at all in a bad way. I simply needed to shift the expectation from my tastebuds. These days, the perfect iced matcha latte leaves me completely satisfied (i.e. not craving my ole go to, Mr. Coffee). I realize that it sounds like a tall order (pun intented), but trust me when I say this iced matcha latte won’t leave ya hangin’. Not only did I create an entire 7 day detox program focused around coffee (butter coffee to be exact), but I’ve been known to travel to three separate coffee shops in one morning in search of the perfect cup (obviously, the first two shops I tried just didn’t do it for me). 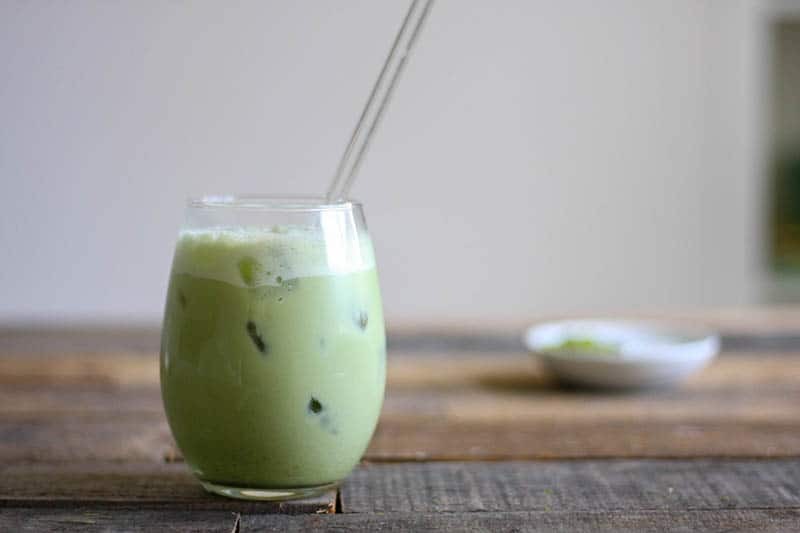 So, I hope you trust my judgement when I say that the perfect iced matcha latte has the power to not only make you question your monogamous relationship with coffee, but it may just become the new front runner in your love life. 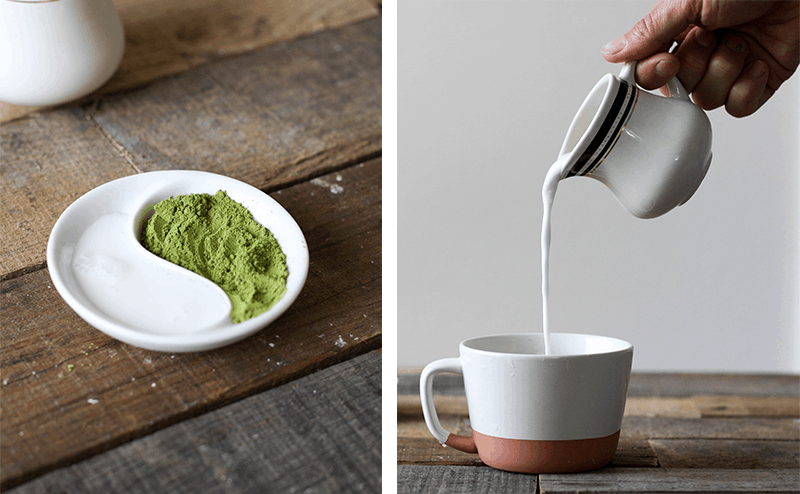 What are the benefits of matcha lattes? As I mentioned before, I started drinking matcha lattes as a replacement to my beloved butter coffee while I was following the autoimmune protocol. I continued drinking matcha lattes once I started learning about the benefits. I’ve noticed that while coffee perks me up in the morning, I can easily drink too much, which spikes cortisol and blood sugar, and makes me feel jittery. Alternatively, the caffeine in matcha is bound to antioxidants called catechins which forces it to be metabolized slower. I’ve heard others describe the energy they get from drinking matcha is more of a “calm alertness”, and I completely concur. When I drink this matcha latte in the morning, I have a really clean, consistent, non-jittery energy all day long. If you’re looking for antioxidants, matcha tea is a powerhouse. It packs nearly 150 times more antioxidants than loose leaf green tea, since it’s consumed as the whole form of the tea leaf (matcha powder is stone ground tea leaves) compared to only drinking what the water can extract from a traditional loose leaf tea. That’s right, since the water can only extract a small portion of the beneficial antioxidants, minerals, vitamins, and amino acids from the leaves. Which means, you’re throwing away most of what you bought the green tea for in the first place. 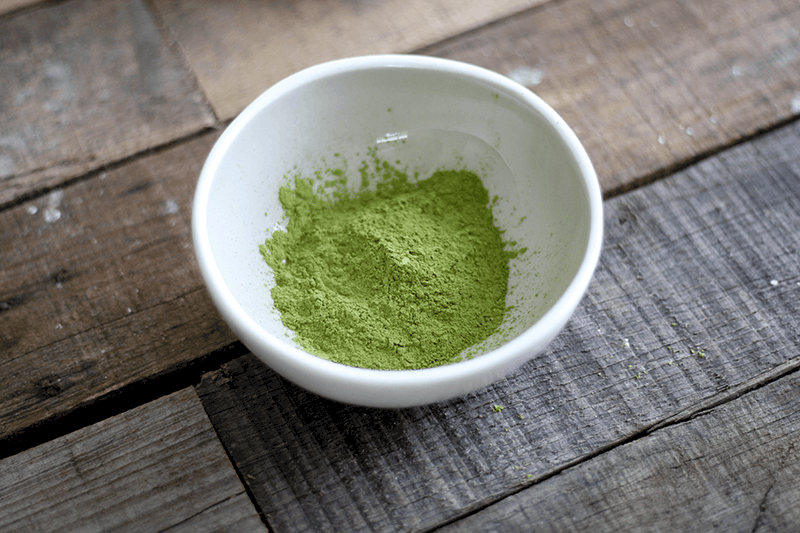 As a quick overview, matcha is an incredibly nutrient dense powder with tremendous benefits. Not a bad thing to drink each morning, eh? I’ve actually started calling it my #superpowder. In fact, just 1 cup of brewed matcha tea is equivalent to 10 cups of brewed loose leaf green tea. Boom! Matcha tea leaves are young and delicate, and most often are hand picked in Japan before being flash frozen to preserve their nutrients. Matcha tea is sensitive to light and heat (I told you, it’s delicate! ), so you’ll want to make sure you’re purchasing matcha that comes in a tin container or an opaque bag, and are storing it in the fridge after opening. 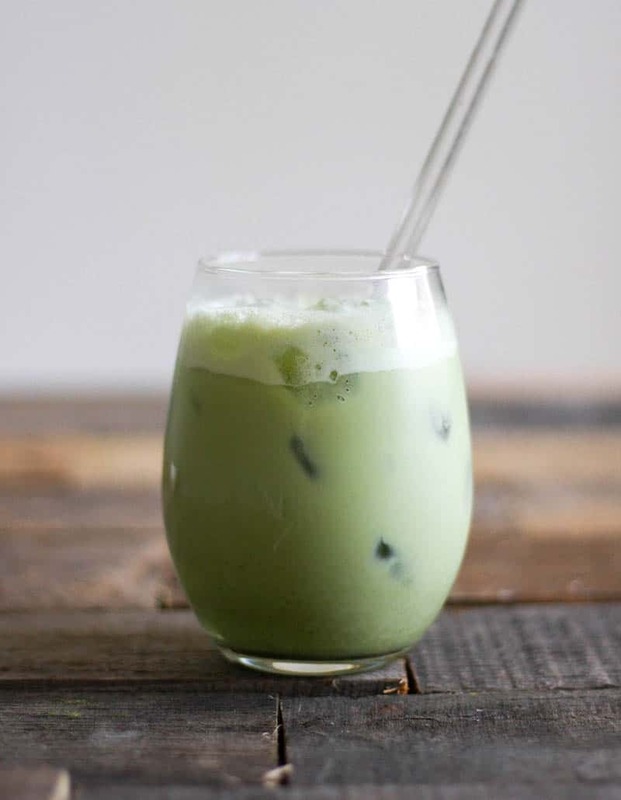 Have I convinced you to try swapping your coffee for an iced matcha latte yet? If the benefits alone didn’t convince you, the flavor and the feeling of energy and alertness you’ll have after imbibing in this beverage surely will do the trick. Heat ¼ cup of your water over medium low heat. Be sure not to boil it! Add 1 tsp. matcha powder to a small bowl, and pour about 1 tablespoon of the hot water on top. Using a bamboo whisk or the back of a spoon, stir the matcha powder into a paste. Combine the remainder of the hot water, ghee, MCT oil, and matcha powder in a glass. You can also use a hand blender for this. Add more hot water if needed. When the latte is well combined, add 1 cup crushed ice to the glass. Use a hand-held frother or a hand blender to combine the collagen peptides, coconut milk, and vanilla. Pour the mixture into the glass with the matcha and ice. Sip and enjoy the beautiful benefits of a high fat, high antioxidant breakfast! I made this today. Initially, I did not follow the directions; I omitted adding the rest of the hot water (I didn’t want to water down my latte). Boy, what a mistake! I now see the additional hot water was to break down the butter. Once,I added the hot water, everything else went smoothly. I enjoyed this recipe, thank you! Oh no! I’m glad you figured it out though! What type or brand of coconut milk do you use? Are the collagen peptides necessary? You don’t need to include them, but the texture will be different. is there any subsititution to MCT oil? something more affordable? Hi Abi! Yes, you can use coconut oil in place of MCT oil. You can think of MCT oil to be a more concentrated version of coconut oil. The benefits won’t be as powerful with coconut oil, but they’re still there!